Last summer, I spent a month doing volunteer social work in Southern India through OneVillage Community Service Foundation. 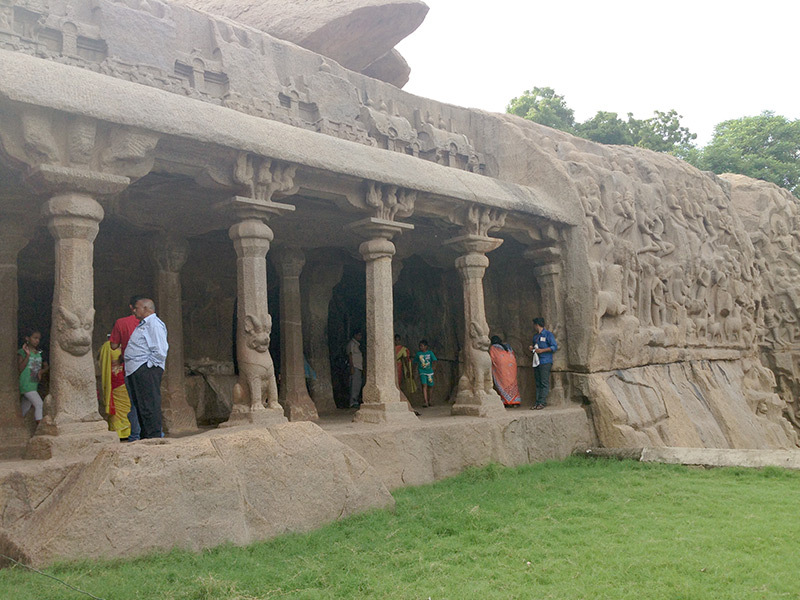 My voluntourism experience took place in and around Mamallapuram. In this 3-part series I share my India travel tips and adventures from my enriching voluntourism experience. 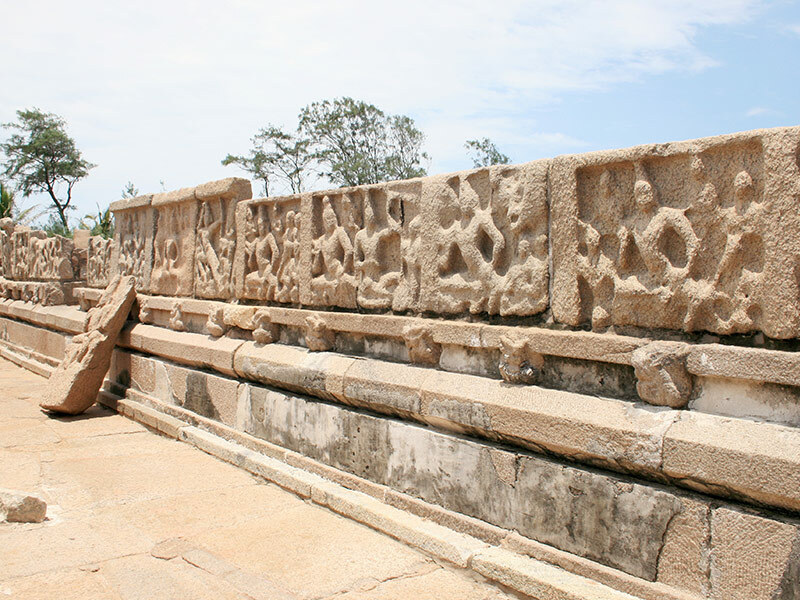 In part 2, you’ll learn about travel in Southern India and visit some must-see temples and sculptures. 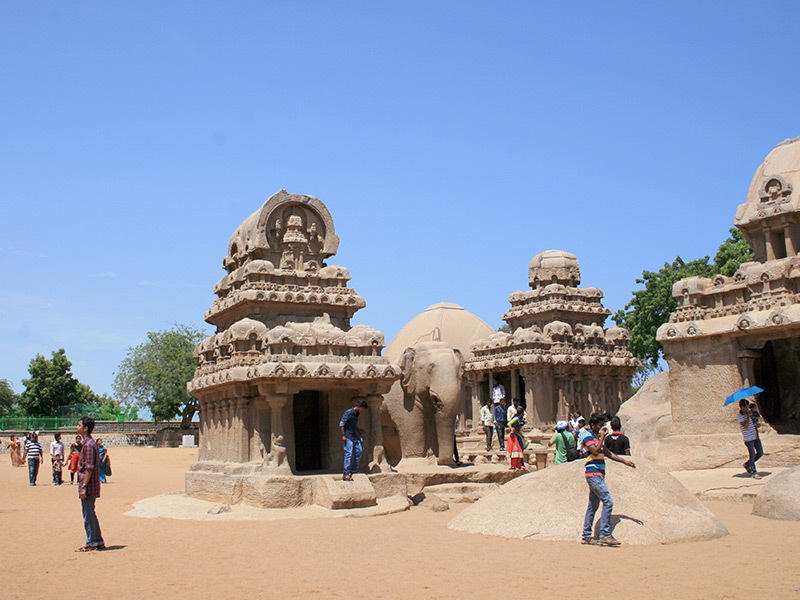 As mentioned in my previous post about volunteer travel tips to India, Mamallapuram is known for its sculptures. 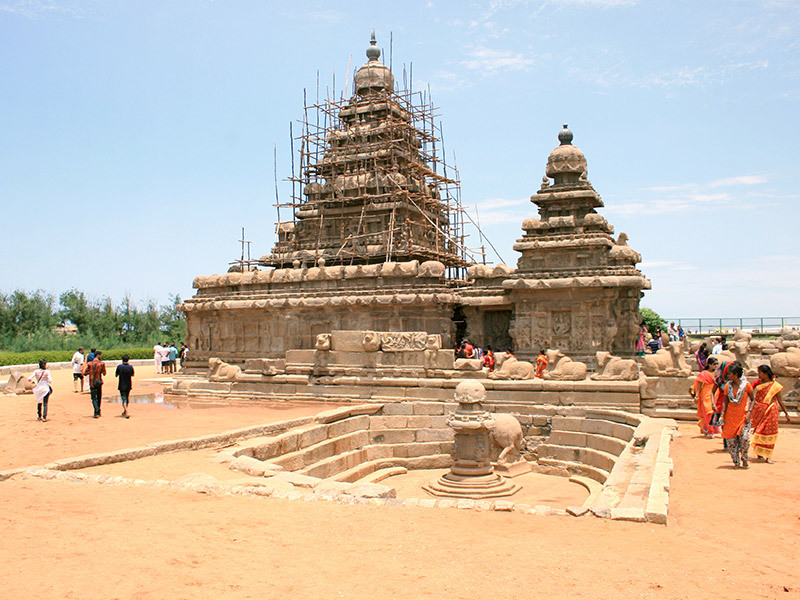 Some of the most beautiful examples are thousands of years old and form part of the UNESCO World Heritage site “Group of Monuments at Mahabalipuram”. They’re all fairly close together and you can see them all in one day if you plan it right. Admission to one gets you into all of the sites; there are also a number of archeological sites around town that don’t require admission. My travel companion/work buddy purchased a book at the local used bookstore that had a list of the local monuments and included the associated legends so we had a little backstory when touring the sites. 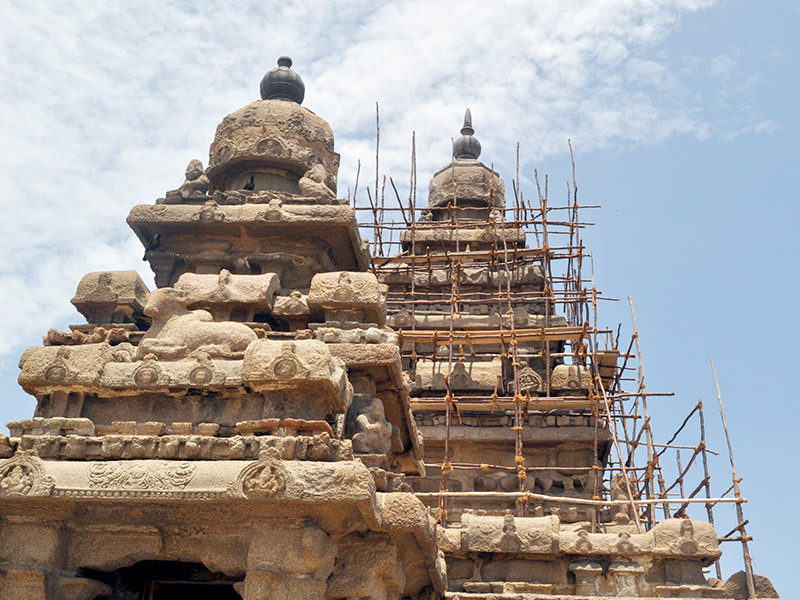 The Shore Temple is currently being restored so there was scaffolding on one of the towers. Luckily we were able to join tourists and worshippers touring the shrines and the grounds. Just beyond the tree line is the shore of The Bay of Bengal. Built in the 8th century, the vimanas (temple towers) highlight the uniqueness of the temples in Southern India. 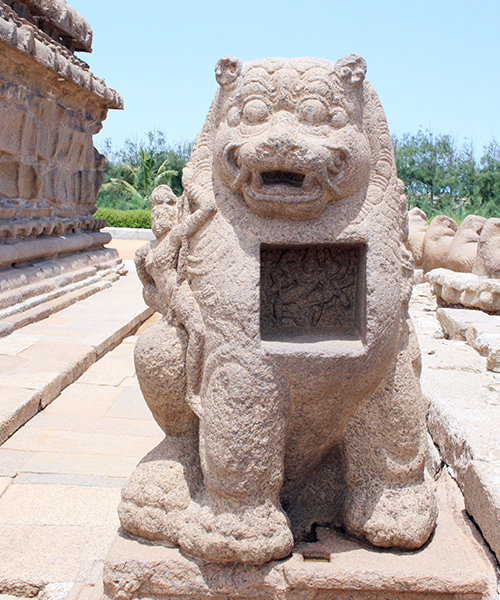 Next to the temple is a sculpture of Durga’s Lion. A close up of the Goddess Durga in multiple spots on the lion. 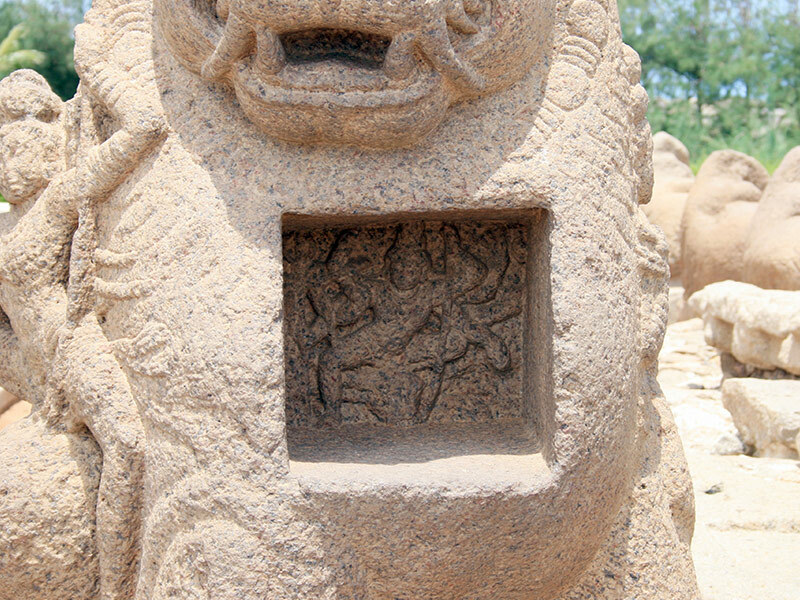 The details on the lion include a sculpture of the Goddess Durga riding the side of the lion as well as a relief of her in the small inset of the lion’s chest. 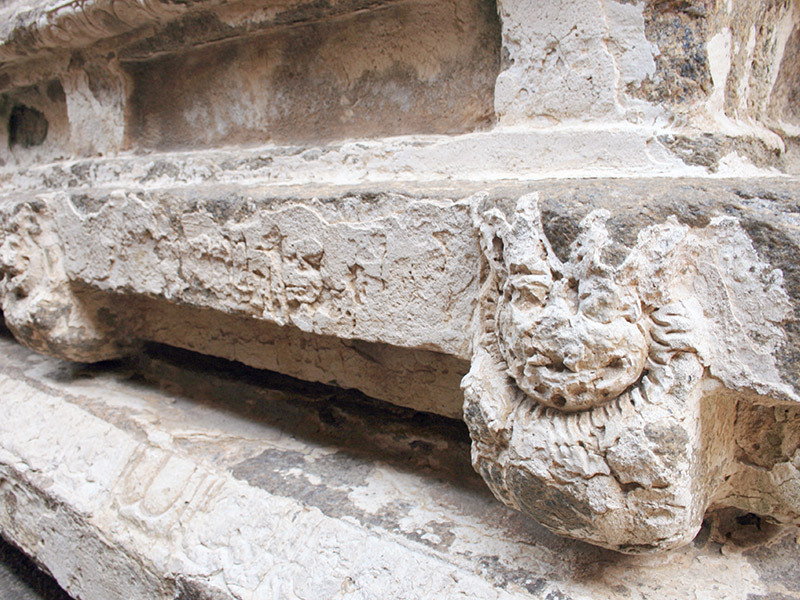 A Boar sculpture and possible offering place on the North side of the temple. Detail at the entrance to the temple. 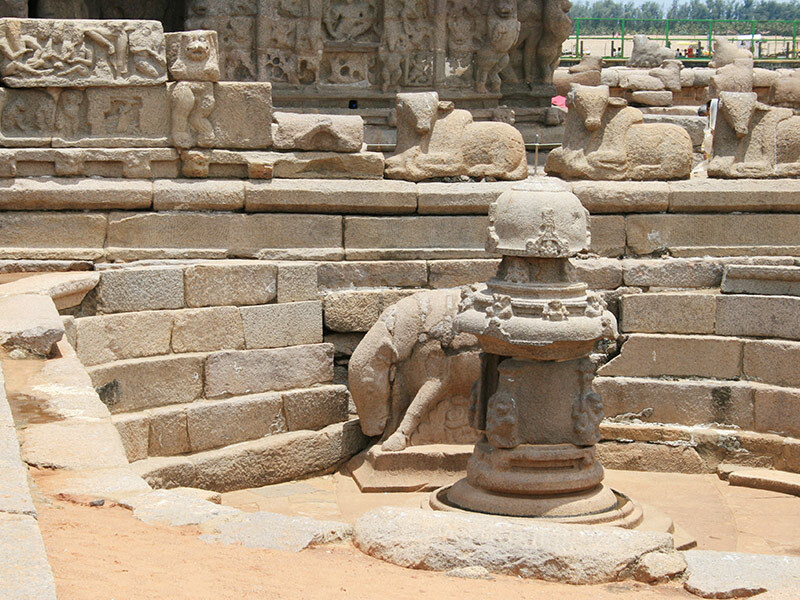 The courtyard has various reliefs and sculptures of Shiva and bulls which Siva rode. 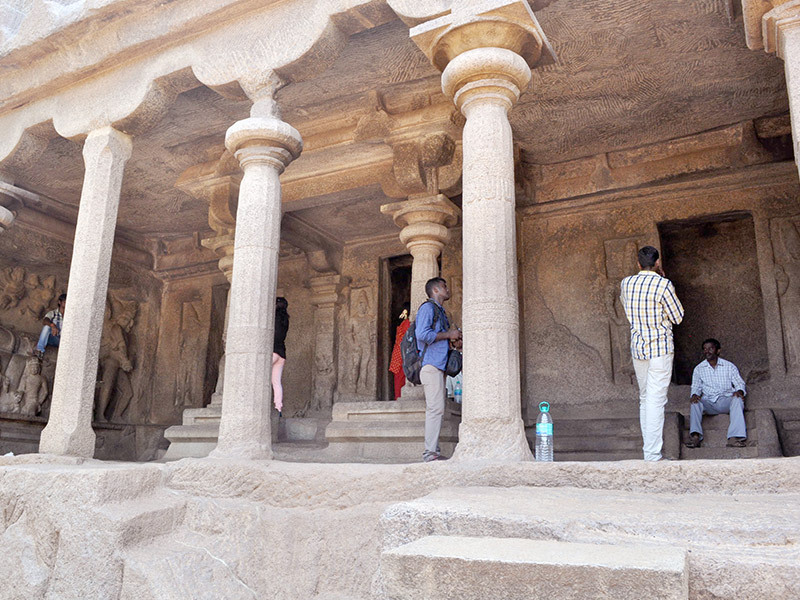 It’s difficult to say what is more amazing about this group of monuments: the pristine condition of them even after thousands of years (7th century), the artistry of the carvings or the fact that they were all carved from a solid piece of rock. The five monuments were built in honour of the Paandava Brother’s, who are heroes of local folk lore and are dedicated to various Gods and Goddesses. A part of the Bas Relief. 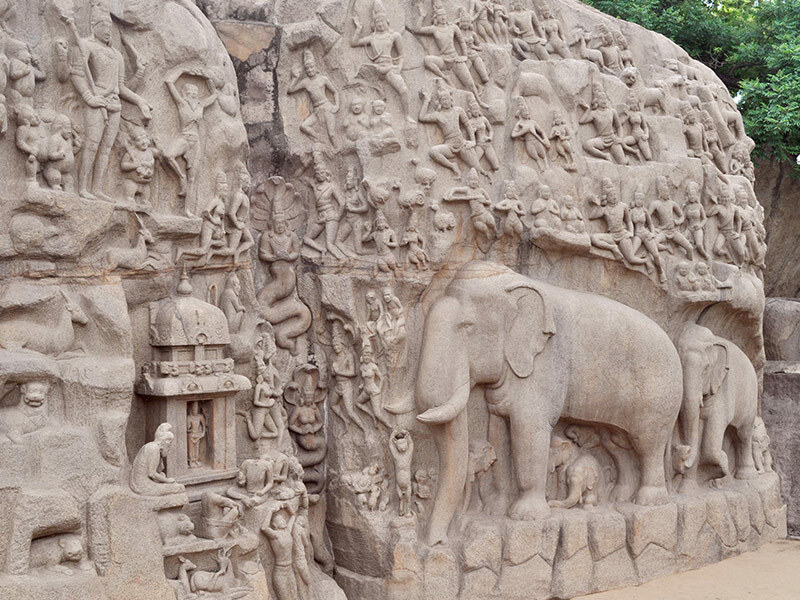 This is the world’s largest Bas Relief and dates back to the 7th century. There are more than 150 images of Gods & Goddesses, sages doing penance, humans, serpents, wild animals, elephants and domestic animals. There is also a giant fissure down the middle, which is meant to symbolize the Ganges River flowing from heaven to earth. A natural rock formation, which has stood for thousands of years. It was named after a story about Krishna. 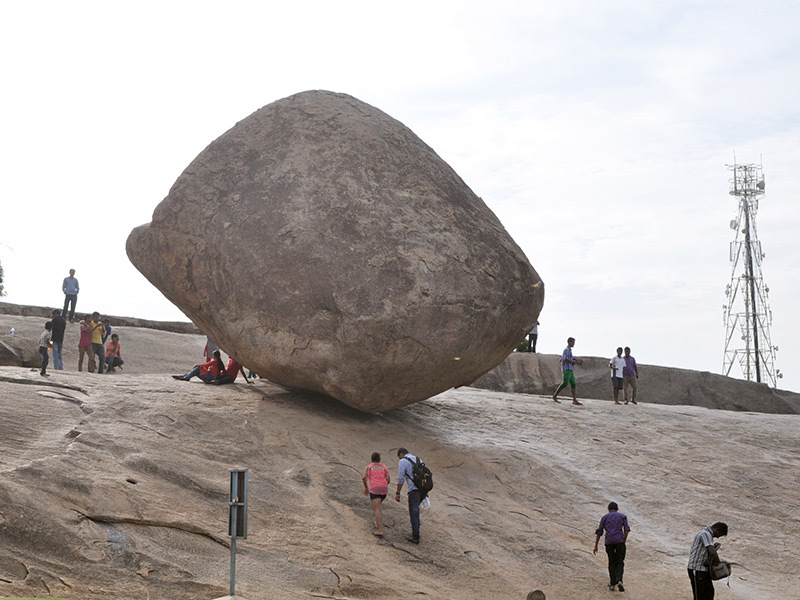 This huge boulder is in a park beside Arjuna’s Penance and seems to have gotten stuck halfway while rolling down the hill, but in fact it’s an optical illusion. Apparently it’s named after Krishna as a young boy because he loved eating butter. Ha! This scene depicts a story of Krishna protecting people from a storm. 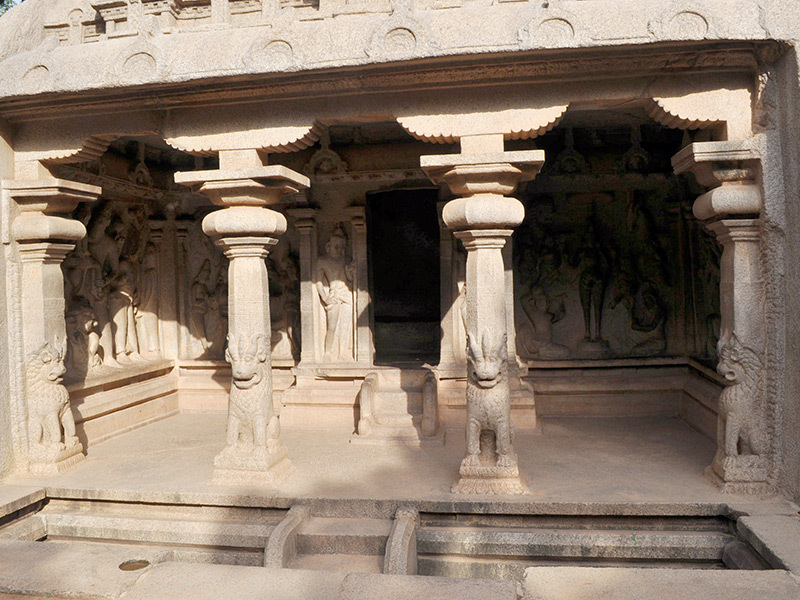 Varaha is the third of ten of Vishnu’s incarnations and this cave temple is located behind Arjuna’s Penance. The reliefs on the walls depict stories about Vishu. 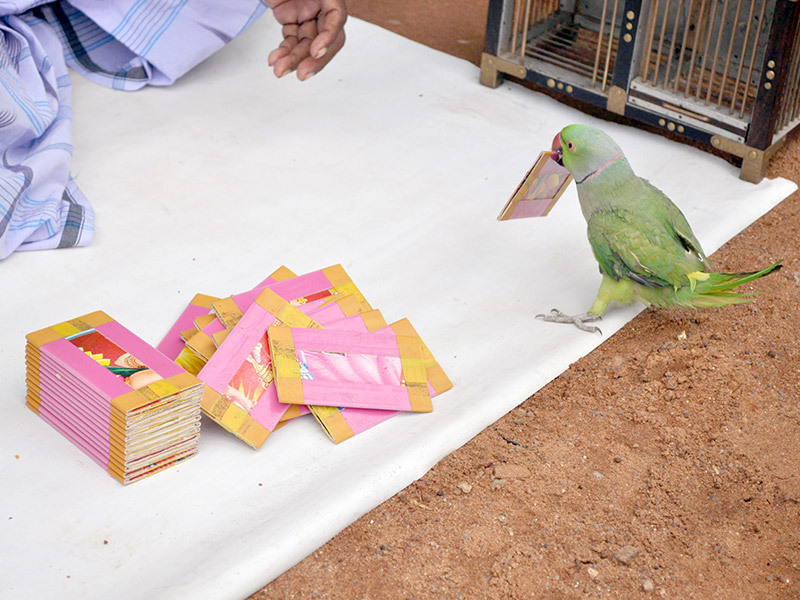 While we were there I had my fortune told by a little bird. Super cute! Thankfully it was a lucky fortune. 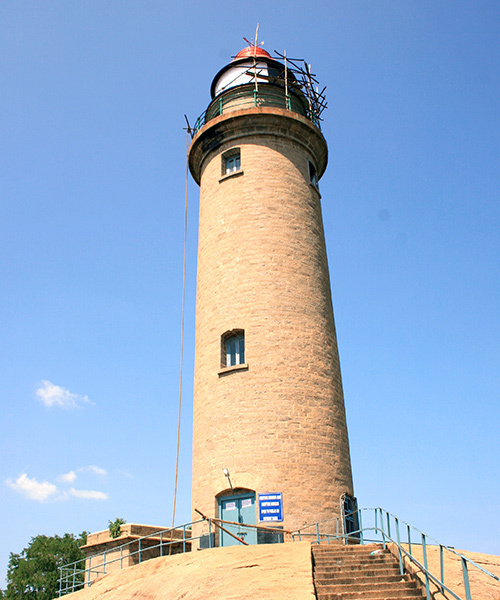 There are a few different sites in this little park including the Light House. 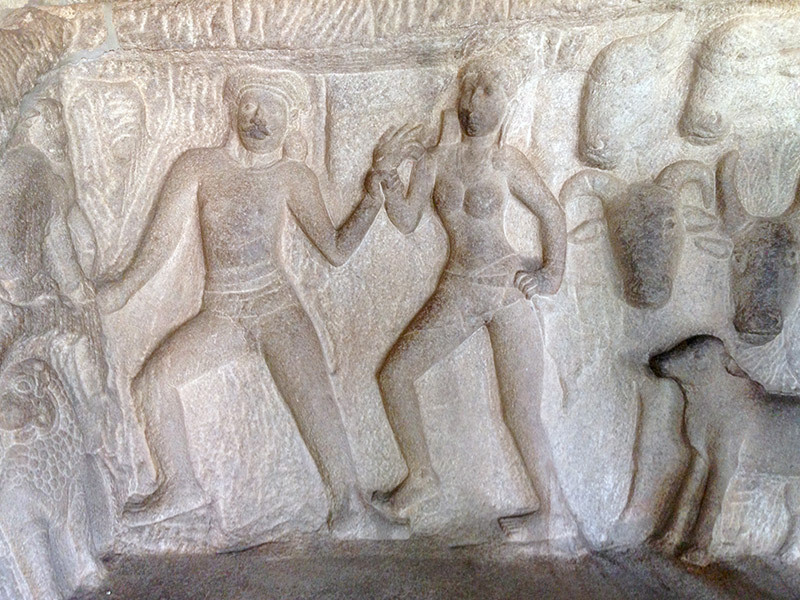 Mahishamardhini Cave with a reclining Vishnu relief. 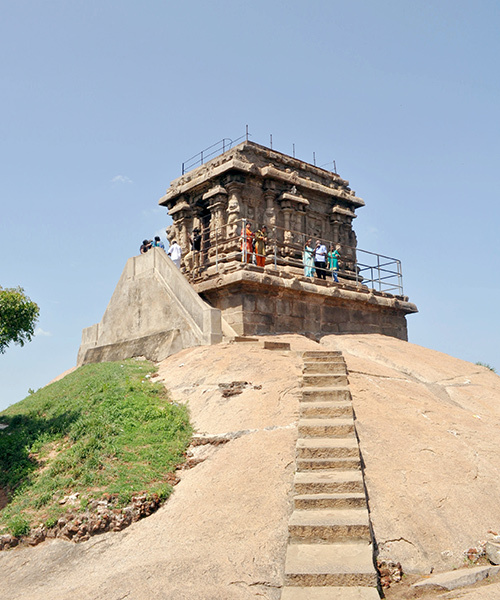 This observatory allows for views of the park and Mamallapuram all the way to the water. 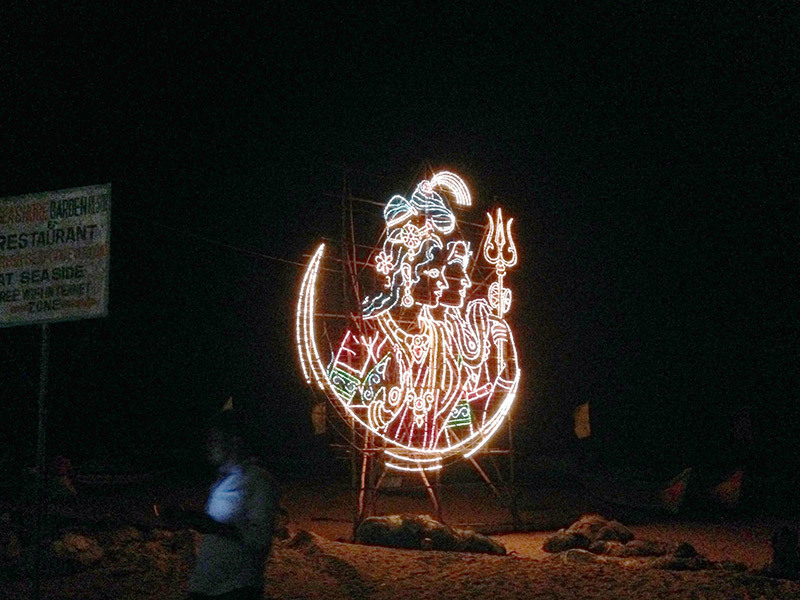 A decorative light display for honouring Goddess Parvati at the festival. During our visit in August there was a festival for the Goddess Parvati (Shiva’s wife), which included light displays, religious ceremonies and music and dance. While travelling in India, there’s a lot going on. Whether you’re volunteering, wandering the busy streets, part of a festival or admiring the beautiful monuments it’s important to have travel medical insurance in case something goes wrong. Knowing you’re covered will give you the peace of mind needed to enjoy this colourful place. Related: For more interesting history and culture lessons, check out our blog post on China. Been to Southern India, or have India travel tips of your own? Share below! Great Escapes: 5 Places to Visit in Goa!